Bob Cousy is from a different era of basketball, but that does not mean his relevance to the sport is not acknowledged by current collectors. One of the best point guards of 1950s and early-1960s and an all-time great for the Celtics, "Cooz" was part of the dynasty in Boston that led to six titles in seven years. 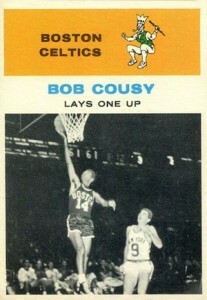 While vintage options are very limited, Bob Cousy cards maintain strong interest in the hobby. Shop for Bob Cousy Autograph Cards on eBay. After a productive college career at Holy Cross, Bob Cousy entered the 1950 NBA Draft. 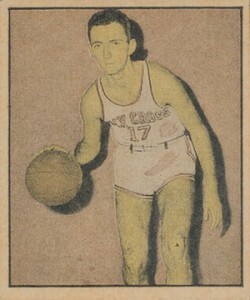 Although he was drafted third overall by the Tri-City Blackhawks (now the Atlanta Hawks), Cousy refused to report due to contract issues and eventually joined the Boston Celtics for his rookie season. From there, the Hall of Fame point guard was one of the best players in the league, earning 13 consecutive All-Star selections and the 1957 MVP. He turned to coaching in college following his retirement in 1963, but after several years, Cousy returned to the NBA as a coach and even played for a short stint with the Cincinnati Royals in 1970. Despite thirteen seasons with the Boston Celtics, there are simply not many Bob Cousy cards available from his playing days. The four vintage releases for Cousy are noted below. After limited options following his retirement, things picked up for Cousy card collectors in the 1990s, including his first pack-pulled autographs. Found in the multi-sport Berk Ross release, the earliest card for Bob Cousy was issued in 1951 Hit Parade of Champions. The set was heavily built around baseball but also included standouts from basketball, football, hockey and boxing. Shown during his college days at Holy Cross, the 1951 Berk Ross card is viewed by many collectors as his true rookie card. The cards were originally issued in two-card pairs with perforation. Although many were separated and are available as singles, intact examples can be located. 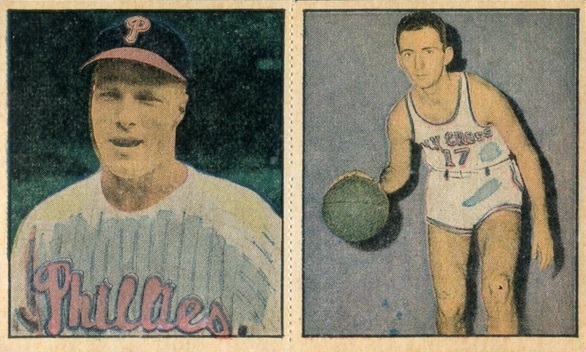 Cousy was paired with Richie Ashburn, a Hall of Fame baseball player who spent most of his career with the Philadelphia Phillies. 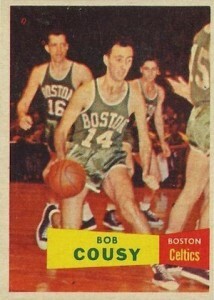 The next Bob Cousy card was not available for several years, but the 1957-58 Topps release is his most popular. 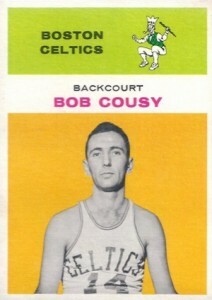 The official rookie card for Bob Cousy came well into his Hall of Fame career and is one of the top cards from the set. Collectors can also find the rookie card for his Hall of Fame teammate, Bill Russell, in the same product. The final Bob Cousy card from his active playing career, 1961-62 Fleer actually includes two cards for the Celtics legend. Bold colors and a classic design make the cards very popular with vintage collectors. A PSA 9 version of the base card sold for just under $1,200 in March of 2015.